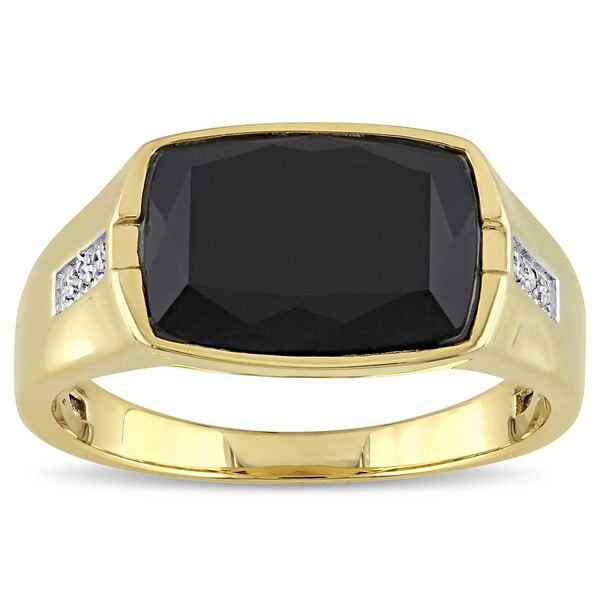 This distinctive Men's ring from the Miadora Collection features a cushion-cut black onyx centr stone and six round white diamond side stones. This extraordinary ring is crafted in lustrous yellow plated silver and is enhanced with a high polish finish. All weights and measurements are approximate and may vary slightly from the listed information. *T.W. (total weight) may vary and is a minimum of 0.025 carat. Treatment code E (Black onyx) and (White diamonds ). See Treatment Guide for further information.